Hey folks, it’s that time of the week again! As a child growing up, we always had sunday night supper. Now, growing up in a chinese household, our sunday night supper was a little different. We went to a very close knit church every sunday morning where all the kids get along and all the parents are friends. After service, we would all go out as a group for lunch then there were about 5 or 6 families that would decide to have supper together that night. The houses always rotated around 3 or so households and the menus were usually in an all you can eat style. Summer Sundays were a huge smattering of BBQs out doors while winter brought around a delicious chinese tradition called “Hot Pot” or “Shabu Shabu” in Japanese. It consisted of several hot plates situated in a row down the middle of the table since there were usually at least 20-30 of us. Then there were different types of homemade broths in pots split into two sections on these hot plates on a constant simmer. Each person is given a mesh ladle and two pairs of chopsticks as well as a bowl full of a sauce doctored by each to their liking. Then oh the spread! There is usually a huge assortment of raw meats, vegetables, noodles and dumplings available and everyone cooks their own food in the broth! Oh it was a ton of fun! Well, it’s been years since I have done those things but Sunday Dinner still stands at my house. It is usually just me and the bf now but we go a more traditional route now with food that is always ready for leftover makeovers throughout the week. Tonight on the menu, roasted chicken with roasted veggies. I started making this recipe when we started playing mmos. I found myself constantly in dungeons and didn’t want to worry about anything burning. Roast chicken usually takes a good amount of time depending on the size of your chicken. I suggest checking the chicken before serving of course but it is usually about 1.5 hour to 2 hours for the process with my small oven here at home. I do have it at 375F for my oven but it can be adjusted if you find it too hot or too low for your oven at home. Pre heat the oven to 375F and line a small baking sheet with tin foil. Take the carrots, potatoes, garlic and onion and toss it with olive oil, garlic plus and onion soup mix. Place on baking sheet in one layer. Place chicken on top of the vegetables and season generously with cajun spice. 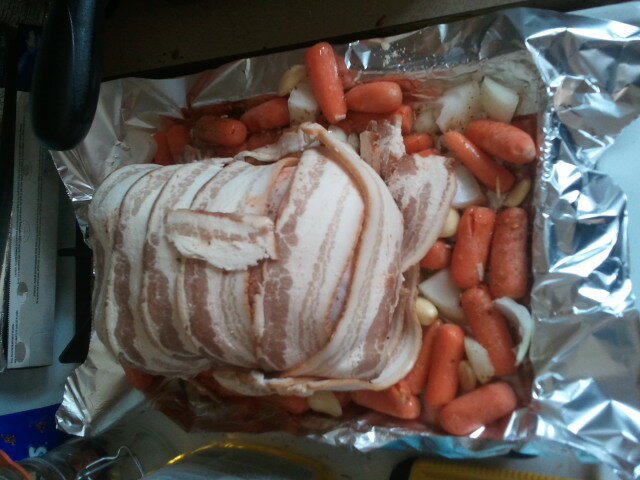 Wrap chicken in bacon. Bake for 1.5h to 2 h chicken at the 1.25h point. If the juices from the chicken run clear the chicken is ready. Let rest for 15-20 minutes before serving. Don’t forget to save the leftovers! I got a few recipes for that too! 😀 Happy Sunday Dinner, Gamers! ← Stop Giving Us Geek Girls a Bad Name!